For months, thousands have turned out to protest the Dakota Access Pipeline project in North Dakota, including many members of the local Standing Rock Sioux Tribe. Protests have not, at the time of this writing, stopped the construction of the pipeline, which is slated to transport 470,000 barrels of crude oil daily from the northwestern corner of North Dakota as far southeast as Illinois. The project has its supporters, including many in local and state government, according to CNN. But there is plenty wrong with the Dakota Access Pipeline, and both the immediate and potential long-term impacts of the project on the people nearest to it merit consideration. Proponents of the pipeline highlight its likely economic impact. They focus on how the unearthing and sale of oil will generate revenue along with increasing American energy independence. There's also even an environmental argument for the pipeline; without it, trains and trucks would be used to transport the oil, which would increase emissions. But opponents of the pipeline have strong environmental and cultural concerns and arguments of their own that they believe were not sufficiently taken into account when the Army Corps of Engineers, a federal decision-making body, allowed the project to move forward. 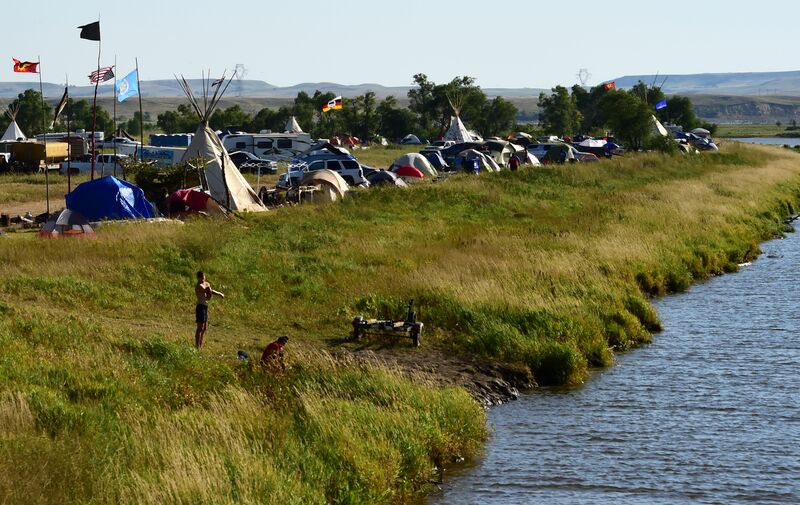 Consider these three major problems with the Dakota Access Pipeline. One major concern among the Standing Rock Sioux Tribe and other pipeline opponents is that it could pose a risk to the tribe's water supply. As environmentalist Bill McKibben noted in the New Yorker, the pipeline was originally slated to cross the Missouri River not far from North Dakota's capital city of Bismarck, but the route was changed partly due to concerns about the potential contamination of the capitol's drinking water in the event of a leak or spill. The pipeline is now set to run half a mile from the Sioux reservation near its water supply, Lake Oahe. As Amy Dalrymple of the Forum News Service reported, the Army Corps of Engineers stated: "Given the engineering design, proposed installation methodology, quality of material selected, operations measures, and response plans the risk of an inadvertent release in, or reaching, Lake Oahe is extremely low." According to Time, there have been over 3,300 incidents of oil and gas pipe leaks in the United States since 2010, and even a small leak could seriously compromise the tribe's water supply. The Standing Rock Tribe and their allies are also resisting the construction of the pipeline because it is expected to disrupt burial grounds and other sites the Tribe considers sacred. In their official complaint filed with the Washington D.C. district court, the Standing Rock Sioux Tribe argued the Army Corps of Engineers of violating the National Historic Preservation Act (NHPA), which requires them to consider whether construction would disrupt sites of cultural or historical significance before issuing federal permits for projects. That Act emphasizes the necessity of consulting with tribes to ensure that the project would not disrupt significant sites. The memorandum opinion issued by the court documents several meetings between the Corps and the Standing Rock Sioux, and several communications initiated by the Corps. The Court ruled that the Corps was not in violation of the NHPA. Its ruling stated that the Clean Water Act (CWA) and Rivers and haRBOR aCT (RHA) "plainly allow the Corps to do just what it did here: preauthorize a group of similar activities that, alone and combined, have minimal impact on navigable waterways. This Court cannot conclude that the Corps does not have the ability to promulgate these general permits at all. As a result, the Corps’ effort to speak with those it thought might be concerned was sufficient to discharge its NHPA obligations." The need to protect the health and the cultural sites of the Standing Rock Tribe has rightfully been at the center of the pipeline protest. A petition to stop the pipeline on CredoAction.com, which has more than 400,000 signatures at the time of writing, states that it would "fuel climate change [and] cause untold damage to the environment." The argument that the pipeline would benefit the environment by requiring fewer emissions in the transportation of the oil falls flat for environmental activists for whom more oil is not part of the rational response to climate change. By beefing up the oil infrastructure, the pipeline would only add to the problem, argue critics. For those concerned about the Standing Rock water supply, their sacred sites, and the environment more broadly, the economic boost the pipeline could bring simply isn't worth it.